Imagine a scientist in your mind. Picture how they look, what they are wearing, how they speak, what they are saying or doing. Before reading on, try doing this exercise yourself. Who did you imagine? A common response to this prompt is a white, relatively old man with somewhat misbehaving hair, wearing a lab coat or blazer, working at a lab bench with bubbling liquids or writing an equation on a chalkboard. In reality, scientists do not all look like Albert Einstein, nor do we all wear lab coats, work with bubbling liquids, or derive complicated physics concepts on chalkboards. Unfortunately, my field of astronomy is not keeping pace with the changing demographics of the United States on multiple fronts. Additionally, only about half of scientists participate in public outreach1—sharing the discoveries at the core of our research, engaging the public to actively participate in the scientific process, and especially encouraging students from a wider array of backgrounds to learn about science. These two issues—a lack of diversity, and a lack of good public engagement—present a real barrier: to tackle the greatest questions that scientists ask, the field demands a diversity of ideas, projects, and approaches for solving problems, as well as the support of the public. So what can we do about these two core problems? To help tackle the lack of diversity in astronomy and in science in general, and to improve public engagement well as our local community relationships in Southern California, in 2017 we started a new, standout partnership with California Polytechnic State University at Pomona. Cal Poly hosts one of the country's longest-running Upward Bound Math & Science programs, a federally funded initiative that provides year-round assistance to high school students interested in science, technology, engineering, and math, also known as STEM, who are either economically disadvantaged, the first in their family to attend college, or both. The power of Upward Bound is demonstrated in their six-year tracking of students, who show remarkable year-to-year progress, excelling in their high school educations, and continuing on to postsecondary schooling. I wanted to connect these two groups of aspiring scientists—the Carnegie undergraduate researchers, who hail from a variety of institutions and are actively pursuing astronomical research, and the Upward Bound high school students, who are exploring the many avenues of science and whether they might want to pursue science themselves in college. In this second year of the Upward Bound-Carnegie partnership, we organized three events to promote interactions and show what it’s like to do astronomy. This partnership serves the dual purpose of giving the high school students diverse examples of scientists-in-training, people who are not far removed from themselves, and of giving our undergraduate interns experience being recognized by others as “science people." 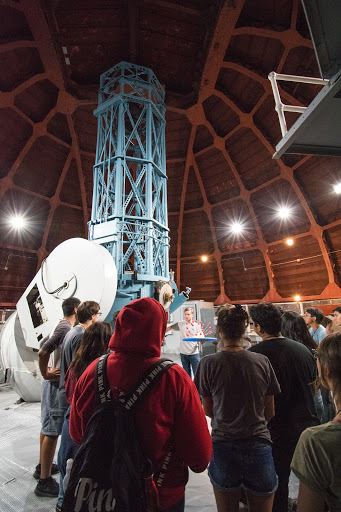 Our second event was a visit to our historic Mount Wilson Observatory with the Carnegie undergraduate interns and Upward Bound seniors. This was a special trip, which we hope will become a much-anticipated reward for seniors who stick with the program for all four years of high school. 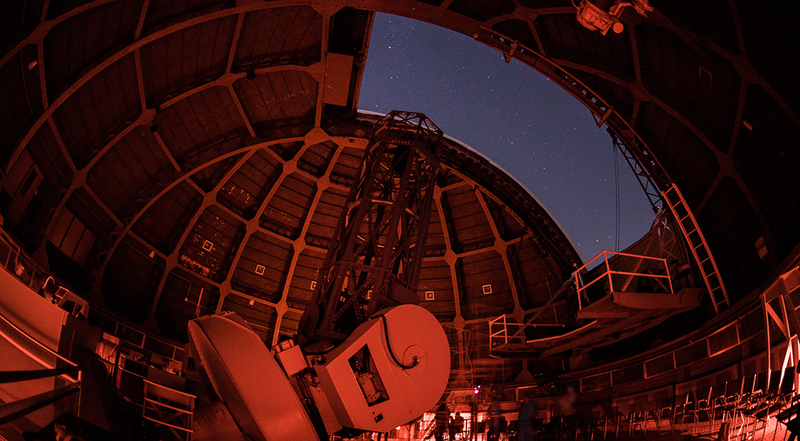 The students were treated to a tour of both the 60-inch and 100-inch telescopes, dinner, and then some nighttime observing through the telescopes that were used to make some of the greatest discoveries in the history of astronomy. Throughout the entire event, the undergraduate and high school students carried on continuing conversations on a variety of topics, including what college is really like and what classes are the best to take. The Upward Bound-Carnegie partnership takes a real step forward in addressing the lack of diversity in astronomy and STEM overall by drawing in populations of students who may not have previously felt welcome, nor have known about the astronomical community and available career paths. The partnership emphasizes Carnegie’s commitment to teaching scientists-in-training and demonstrates that public engagement is fun, rewarding, and important. 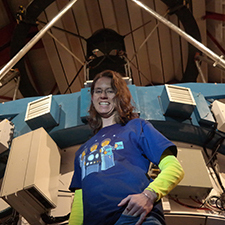 “The partnership allows us to reach a great group of high school students and share with them our love for science. It also instills in our undergraduate interns the value of communicating with the public, and places our students in a leadership position, strengthening their confidence as young researchers,” said Rudie. We hope to continue our partnership for years to come—building our relationships with the Upward Bound students as they make their way through the program, graduate high school, attend college, and maybe even come back to Carnegie as summer undergraduate interns!